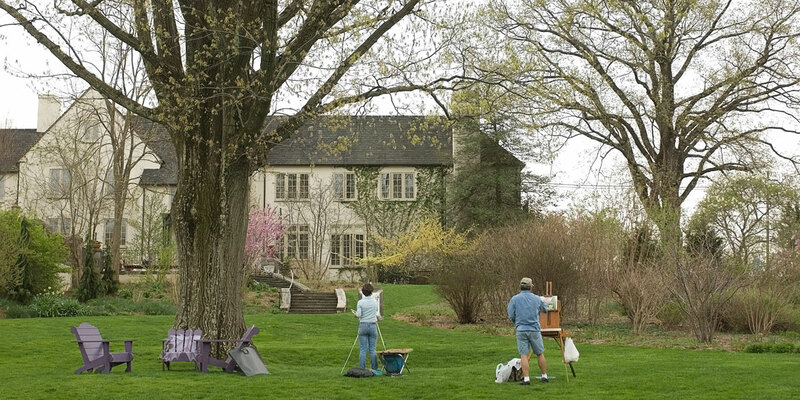 Wayne Art Center Plein Air Festival is a jured event dedicated to enhancing the public’s awareness of outdoor painting while providing a venue for established and emerging artists alike to share creative endeavors with collectors and the public. Wayne Art Center’s Plein Air Festival is an exciting opportunity to bring valued talent to our community. More than half of the artists come from other regions stretching up and down the East Coast and Midwest. This year with the growing awareness of the Wayne Plein Air Festival, there has been an increase in the number of applicants and the festival is attracting artists from as far away as California. The first Wayne Art Plein Air Festival was held in 2007 with the intention of making it an annual event. Artists had to mail in slides or CDs with their artwork for juror Sara Linda Poly to review. The 33 participating artists were primarily from the East Coast, although a few came in from the Midwest to paint in Wayne. The paintings were displayed in the newly-completed, bright and spacious Davenport Gallery, and the Preview Party was held in the new Vidinghoff Lobby, taking full advantage of the Center’s 2007 renovation and expansion. Over the course of twelve years, Wayne Art Center’s Plein Air Festival has grown to be one of the premier outdoor painting events on the East Coast. The application process is now fully online, attracting the foremost plein air artists from across the country. The paintings produced are displayed across the Art Center in the Davenport, Vidinghoff and Outer Galleries, and more than 200 guests attend the Preview Party to have the first chance to see the new artwork. Thanks to generous sponsors and patrons, we are now able to offer over $10,000 in awards in recognition of the artists’ talents. We appreciate all of the artists, jurors, sponsors and patrons who have made the past ten Plein Air Festivals so exciting. We look forward to Plein Air 2019 and to seeing what the 13th annual celebration brings! The 13th Annual Plein Air exhibition will be on view from May 20 through June 29, 2019 in the Wayne Art Center galleries.